I knew there was going to be a lot of people, tight security because of all the VIPs coming, parking was going to be difficult, not to mention I haven't sung with the UP Concert Chorus in a long time...but there was no hesitation when I replied: Yes, I will go. After some errands in Makati and a light KFC take-out dinner in the car, Liz and I made our way to La Salle, Greenhills. Along the way, we could already see the yellow ribbons on the vehicles around us, on the branches of trees along Ortigas Ave, even on lamp posts and road blocks, all leading us to where we needed to go. When we got there, we found La Salle had been closed for entry so we parked across the street and walked to the gymnasium where the mass was going to be held. There was already a long line of people waiting under the rain, hoping to get one last look at the beloved former President. Inside the gym, the lights were bright but the mood somber and respectful. There were chairs arranged in rows in front of a makeshift stage, and in between was the casket with the remains of Tita Cory. There were 2 cameras on extensions, several more cameramen going around, and there was a row of tables with laptops and other gadgets on them which I assumed were the press people. I looked around and saw her family: I saw Kris Aquino was being interviewed, I saw Jiggy Aquino-Cruz, one of her grandsons who I happened to read about in a magazine just before going to the wake, Mikee and Chynna Conjuangco were there too. Mayor Sonny Belmonte was there, VP Noli De Castro, Mayor Alfredo Lim, Sen. Loren Legarda, former President Fidel Ramos and a host of other political figures were present. Media personalities and celebrities were also in attendance: David Celdran, Charo Santos-Concio, Bianca Gonzalez, Tessa Prieto-Valdez. Singers Jose Mari Chan, Jaime Rivera and Gary Valenciano were also present, and later gave tributes and sang after the mass ended. Being inside the "VIP" area, we did not have to line up from outside to view the remains of the late President. So we took a short queue from inside the barricaded area, Liz and I went together, to see her in person for the first, and for the last time. Cory looked peaceful, her face bright, her hands clasped and holding a golden rosary. I uttered a short prayer for her, and before we left, I gave her a small bow to show my respect. I would have preferred to have sung for her in a different setting, but I guess it must be this way. Even though I was singing with 20+ other people in the choir, it felt like it was my personal tribute to her. It was an honor to sing for her. I will always remember her as a shining symbol of hope and democracy for the Filipino people and for the world. Thank you for the inspiration, Cory Aquino. Here's the only Youtube video I found of the mass with us singing in the background: Click here. what an honor. a day you will remember i am sure. wow. what a great opportunity. di ko man nakita yun alam kong you've done well. i know. 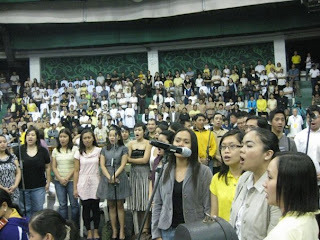 wow..bigatin pala ang choir nyo. that is a big honor.. It was an honor, even if it wasn't the way I envisioned myself to be a part of history! That was a very selfless gesture. I am sure that your voices resounded in the heavens and greeted here there. "Even though I was singing with 20+ other people in the choir, it felt like it was my personal tribute to her. It was an honor to sing for her. I will always remember her as a shining symbol of hope and democracy for the Filipino people and for the world." That much is true, Rey. Well said. I'm glad you wrote it all down here in your blog. Everything tastefully done, Rey. I'm proud of you. Nice of you to write about it, Rey. you're very lucky, you got a chance to see her at the very last time. We were not able to see her because of the weather and malayo yun dito sa amin. Yeah. And what my memory cannot hold, I have written here. :D Blogging is great that way. Thanks for your trust Badong. 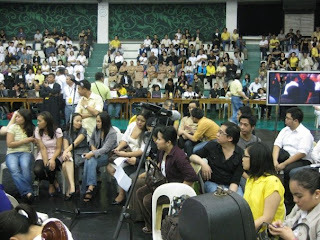 We did our best to give Cory Aquino a good mass choir. I've sang in the presence of Imelda Marcos, Fidel Ramos and even Pres. GMA, but I don't recall ever singing for Cory before. So this was really a first. and unfortunately, also a last. it was an honor. a huge one. Thank you for your kind words Master Jedi Jan! Wasn't it a good decision though? Thanks for supporting me! That's too bad Kelvin. But really, if I didn't need to be there, I probably would have thought twice about just going. Did you see the videos of the crowds yesterday? Wow. Wow ang sowsyal! :-D anung pyesa ang kinanta nyo? Recent blog:=- Kalyo or what?! Your post made me teary-eyed. I don't know, I am emotional with Pres. Cory's death. Merely seeing the crowd yesterday as her remains are transferred to Manila Cathedral made me cry. nic blog you hae here.. Recent blog:=- GaLiNG! hUwAW PiLipiNaS! Indeed. I guess Cory is to me, one of those key figures in history that gave us all hope when we felt everything was lost. Despite everything people say, and despite her recent associations with Erap (oops), I still do respect her. I see her as a person of high moral fiber, and an enduring legacy of democracy for the Filipino people. Bilis bumalik ah! :D Thanks sa pag add! wee! Wakes and funerals make me uncomfortable. It actually makes it really hard to sing when you have a lump in your throat from trying not to cry. Well at least you have shared something for the former president. Yeah, at least I got to sing for her, even just once. What is the line up of songs during the 8pm mass? Galing ng version nyo ng EMPOWER ME and The Lord Bless you and keep you(Final Song)..